SnugFit™ compartment suspends and wraps laptop for superior protection and security. Provides on-the-go access to key items. Ballistic nylon protects against abrasions, punctures and tears. 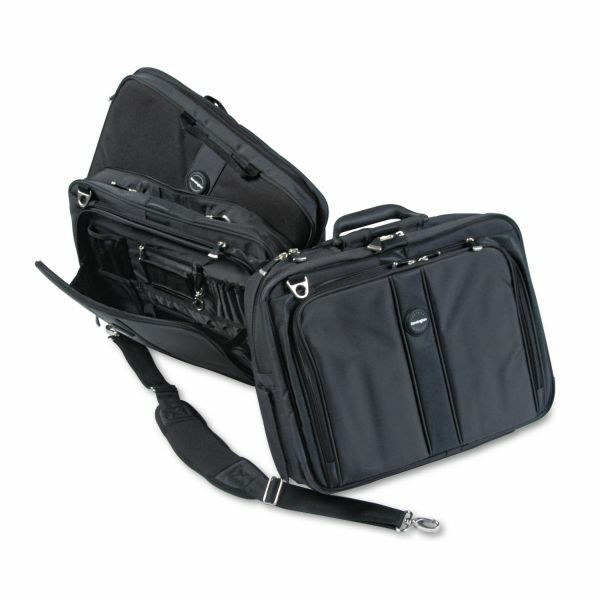 Kensington Contour Pro 17" Laptop Carrying Case, Nylon, 17 1/2 x 8 1/2 x 13, Black - Contour Pro Laptop case features a SnugFit protection system and a unique contour panel that helps reduce shoulder and neck fatigue by 35 percent. Ergonomic handles stay together and evenly distribute weight. Shock-absorbing, contour shoulder strap is secure and comfortable. 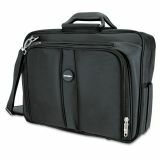 Laptop case accommodates all laptops up to 17. The convenience compartment is designed for on-the-go access to aircraft tickets and more. 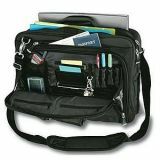 Front pockets are situated for easy organization and access. Padded rear compartment keeps peripherals from poking through. 1680 Denier Ballistic nylon protects against abrasions, punctures, and tears."